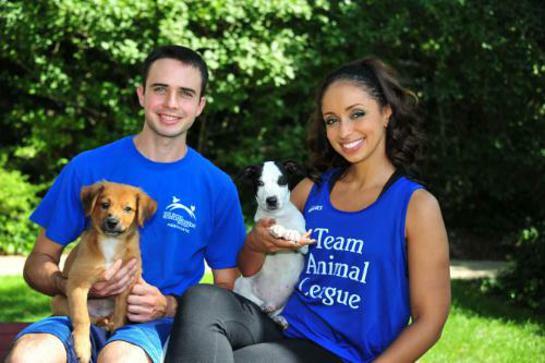 Grammy Award-winning singer Mya will join fifty other animal-loving athletes aiming to raise $200,000 for the dogs, cats, puppies, and kittens of North Shore Animal League America, as members of Team Animal League in the ING New York City Marathon. Team Animal League has a few slots open for runners interested in participating, and all animal lovers can show their support by sponsoring an individual or by donating to the entire team. The members of Team Animal League, including shelter associate Michael Dorman (pictured with Mya) and runners from New York, New Jersey, Connecticut, Arizona, Minnesota, Florida, Texas, Colorado, and Colombia, South America, are in training, preparing to traverse the 26.2 miles through New York’s five boroughs by foot on Sunday, November 6, 2011. Before crossing the finish line, Team Animal League aspires to cross its collective pledge goal through the generosity of friends, family and supporters. All donations will benefit the Animal League’s life-saving mission to find permanent and loving homes for approximately 20,000 homeless pets each year, and to help educate the next generation to become more humane in the treatment of animals. Known in the entertainment industry as an internationally known, respected and loved singer, songwriter, dancer, actress, and philanthropist, Mya is known throughout the animal loving community as a strong advocate and supporter of saving animals’ lives. Mya has five pets, including a sweet cat named Mellow who she adopted from the Animal League. This is the fourth year that the Animal League, the world’s largest no-kill animal rescue and adoption organization, has had the support of ING New York City Marathon participants. In 2008, Animal League spokesperson Beth Stern founded Team Animal League as a runner, and since that time the Team has raised more than a half million dollars to help save animals’ lives. To learn more about Team Animal League, visit AnimalLeague.org.